Lake Álftavatn soaked the sky in with a giant yawn. Hikers followed suite by unzipping their sleeping bags, testing their knees, stretching their fingers out like obnoxious sun rays. Day three on the Laugavegur trail. Day three, further and further into the giant outstretched hands of the mountains. I got out of my bed and walked to the singular window in our mountain hut. I stared out at the mountains and they stared back, they understood. We were both ready for this. The routines fell into a repetitive rhythm: put on overused camp clothes, eat muesli, “who wants to cut the apples? ?” pick which tea you want, accidentally over-steep (in my case), make your sandwiches of the day, “can someone pass me the salami!” “who has a knife?” clean up your mess, brush your teeth outside at the sink, make sure not to sit on the frost covered benches, lace up your shoes and get outside. Put on your backpack. Soak in the landscape with two eager eyes. Start the day. Today’s trek consisted of the flattest part of the trail. 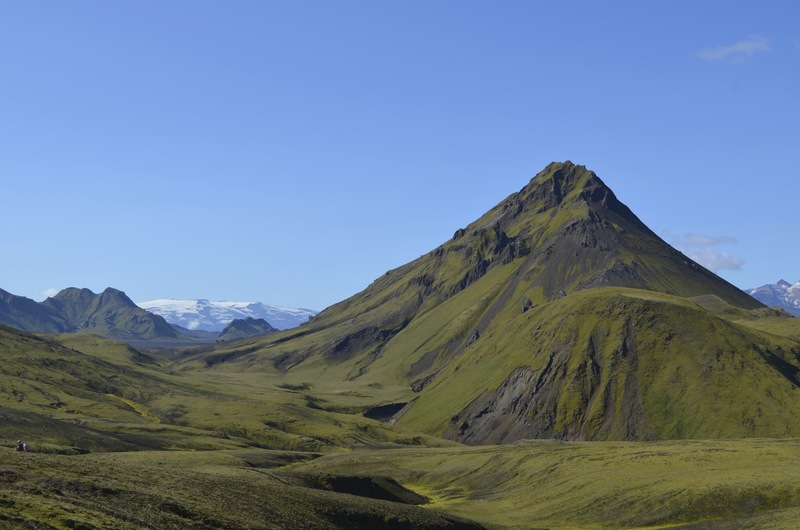 Our guide, Svavar, mentioned that there were a few ups and downs in the valleys towards the beginning of the day, but we knew better. Svavar has this Icelandic mentality of claiming things aren’t as bad as they usually are to everyone else. 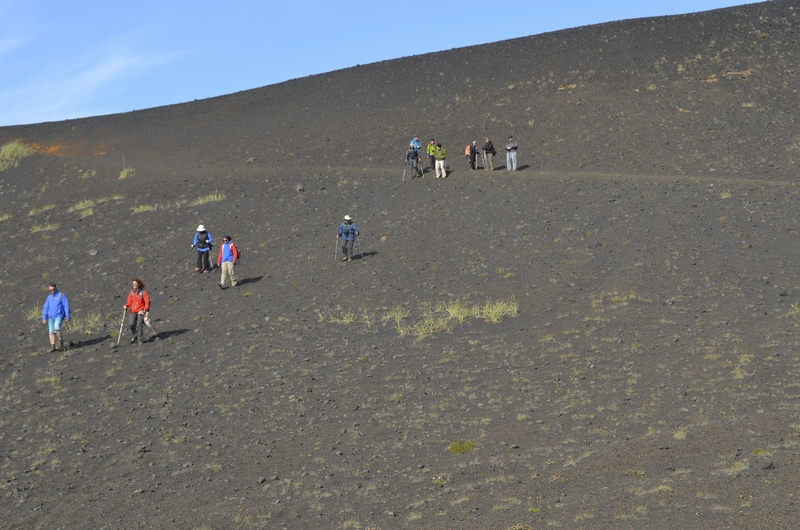 He’s also a trained guide, taking this trek multiple times a year, so anything is easy to him. “A few ups and downs” to him is quite the incline. At the start of every hike he mentions a difficult part and says, “TOO easy!” which sends all our eyes rolling, because we know that means expect the worst. 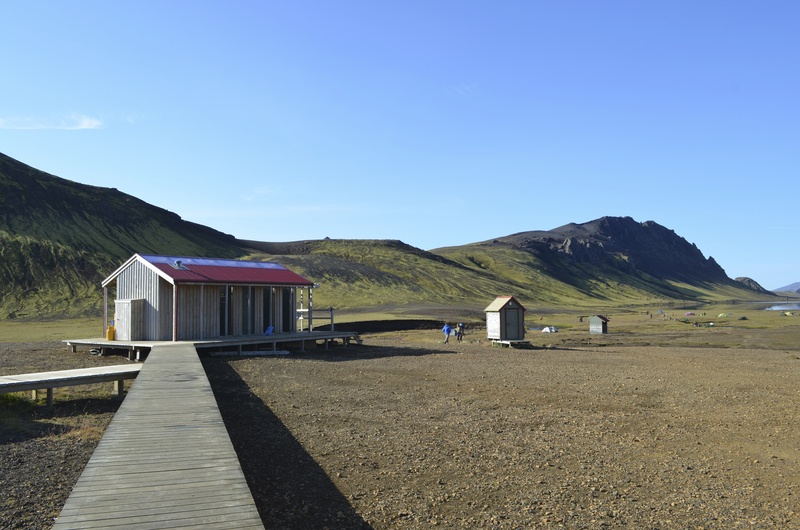 After these ups and downs we were going to be entering an Icelandic desert of sorts, mixed in with a few river crossings and a giant canyon before we got to the hut Emstrur. Yeah, TOO easy. We weaved our way through the weather-less landscape, feet into green moss, minds into the mountains. The giant rock formations rose like waves bending towards a shore. I wanted to be the shore. We were the lulling footsteps of waves in motion, we created the motion in the waves by our descending and ascending. Feet up this curve, down this curve, fluid movements in the toes, zig zagging across the landscape. 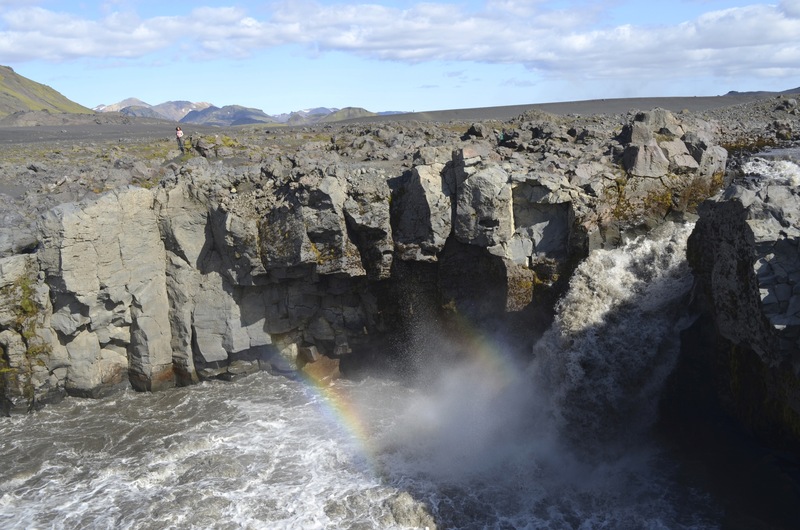 The location of our break was at powerful waterfall which tunneled under a set of two rainbows, both of which were delicately hanging in the mist. Cookies were passed around and sandwiches eaten, mist was settling and water was churning. I took a walk out beyond the fall and laid down in a nice patch of moss. I was alone with “Varuð” by Sigur Rós playing through my headphones. 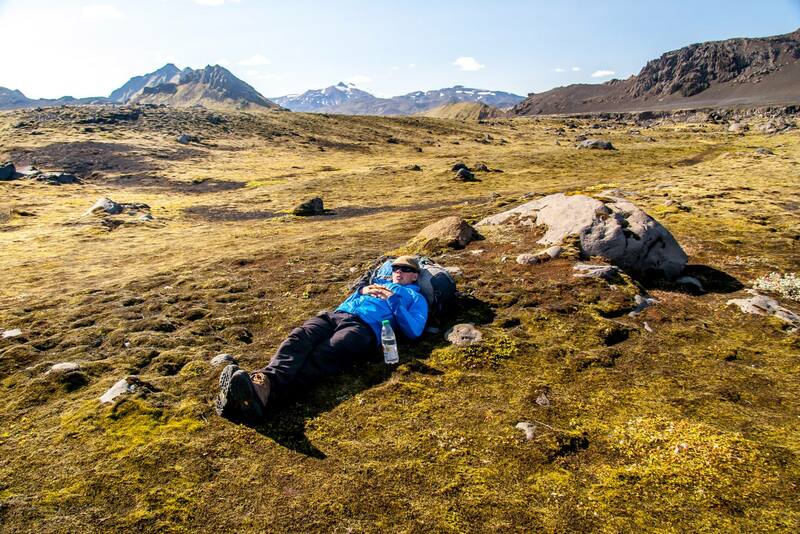 In my trips through Iceland I came to find that moss is one of the best things to lay against while in contemplation. The right Icelandic moss is soft and sinks a little when you put your weight on it. It also retains the warmth that it soaks in from the sun. You feel as if you’re lying on a warm carpet of, well, soft moss. I wouldn’t have any other way of describing it. Perhaps it’s like a heated carpet, but more alive and more comfortable. I had taken off my jacket so I could lay my bare arms against it, and it held me up with its complex, internal support structure. When you lie on it, theres never a though that you’re crushing it, it retains itself well. And so I stretched out, stomach down on this bed of moss. My body molded ever so slightly into it and I began to doze off, cheek pressed into the green earth. I watched the mountains from the side of my vision, I felt that they was moving, that time was slowing down for me and speeding up for them until we reached the same equilibrium of time and space. My eyelids became heavy from the rays of sun beating down on them, and I saw beauty beneath them as they closed over me. 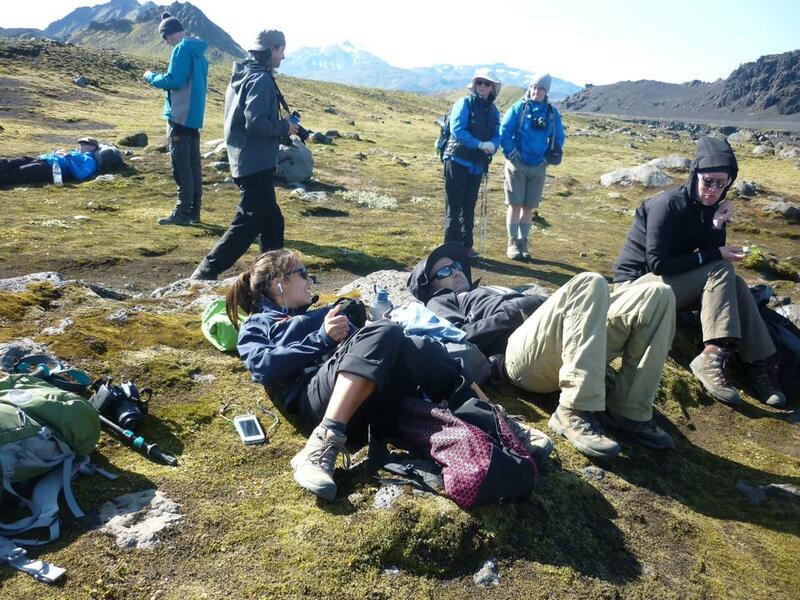 When I felt that it was time to leave my tranquil surroundings and return to the group, I found that our guide had dosed off more successfully than I had, and we had a great time poking fun at him for sleeping on the job. 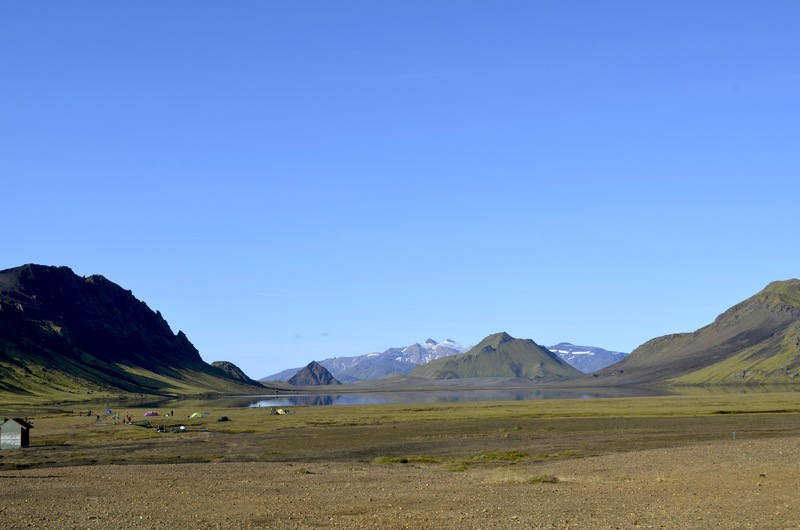 Once woken, he led us on to the last bit of our 15 km hike: the Icelandic desert. Of course, this wasn’t actually a desert, but it came close. We were warned that if we wanted to use the bathroom, we had better find a rock now or we’d be peeing in front of a large audience in the middle of the black sands. 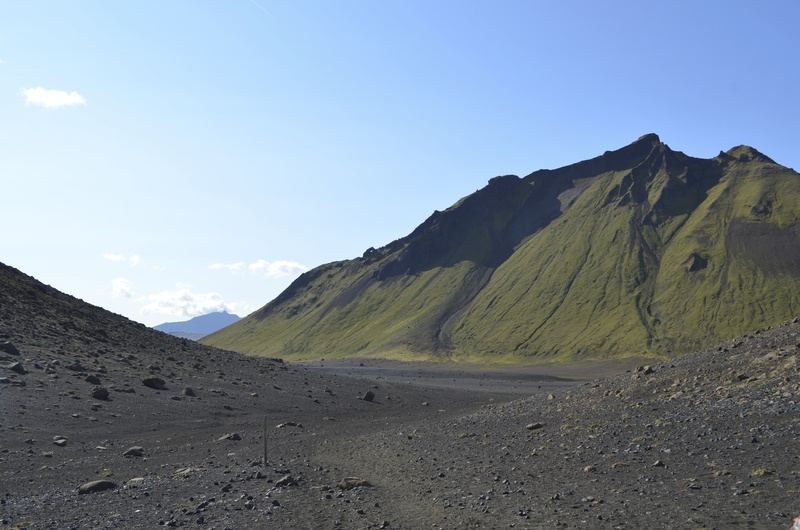 And black sand there was, tons and tons of it whispering away between the lone mountains. Trekking through desert-land is mentally dampening, no matter the distance which you’re hiking through. It does things to your mind, you feel you lose track of time as you carry on hill after hill after similarly looking hill. The sand contributes to the dragging of your own feet, you have to lift your leg more purposefully to tread through the fine desert graininess. Every few moments I would channel my cupped hand down at my sides and gather some sand in my hands. It was of the purest grey-black, varying from finely grained to a soft power. Memories of this odyssey become blurred with the grains, they become muddled in a black summer wonderland. It was the mountains that took over and guided us, and we calculated our distance based on our location relative to each singular peak. I found that this was the one part of the trip where I had my camera out and failed to take any pictures of the most barren parts of this hike. Perhaps at the time it felt dull compared to the backdrop of lonely green mountains. 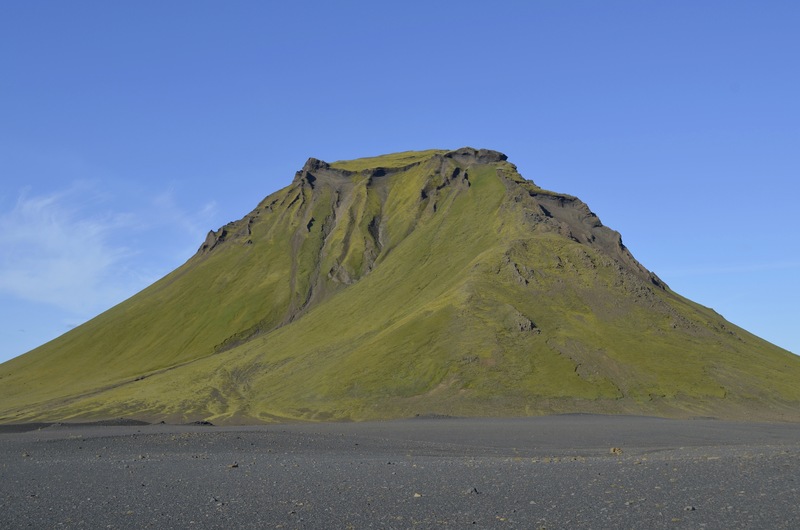 This last mountain had a base that resembled a peculiar patter, almost like wrinkles brushed along it’s surface. 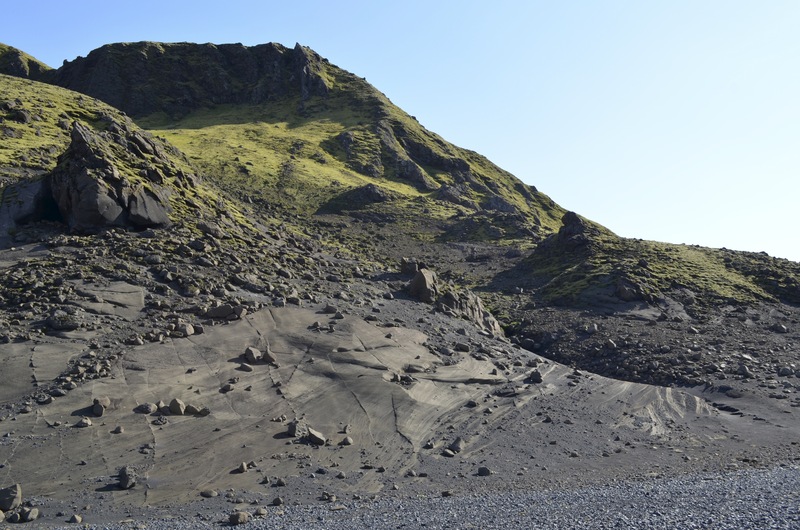 All these mountains were aged indefinitely by the impact of the rocks pervading over it. Through the elements it was actually weathering itself. It was beautiful, to think that the mountain was eating itself away, crumbling over itself. After a few hours, we reached the last incline in our voyage through the black, grainy depths. A warden nicknamed Nonni (short for Jón) from one of the huts (who was also cooking for us and taking our food/luggage to each hut) raced by on his bike to greet us, indicating that our hut was near. 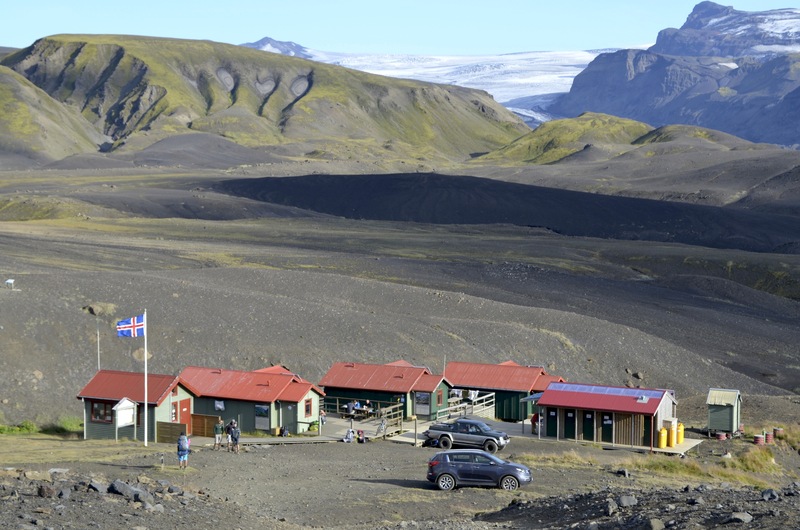 Before heading to the hut, Svavar had one last surprise phenomenon to show us. 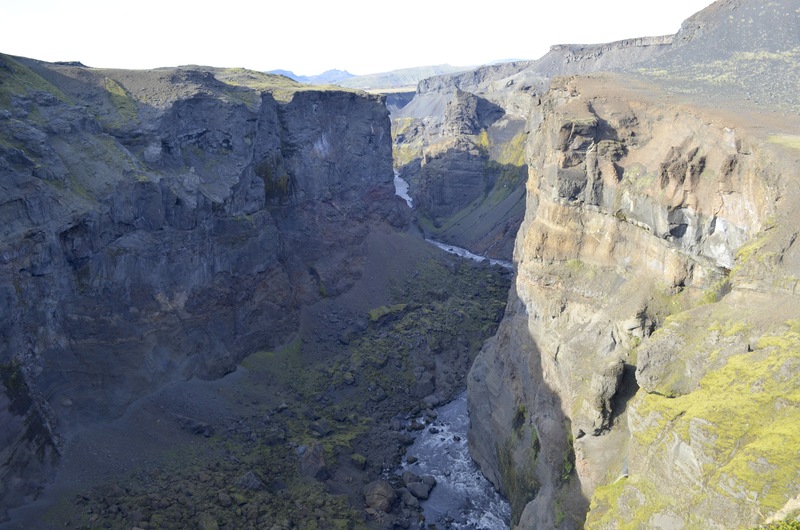 Right in view was a giant drop to a large gorge/canyon a short distance from where we would be staying that night. It’s called “Markarfljótsgljúfur,” lying 200 m deep into the earth and carved out by the Markarfljót river. 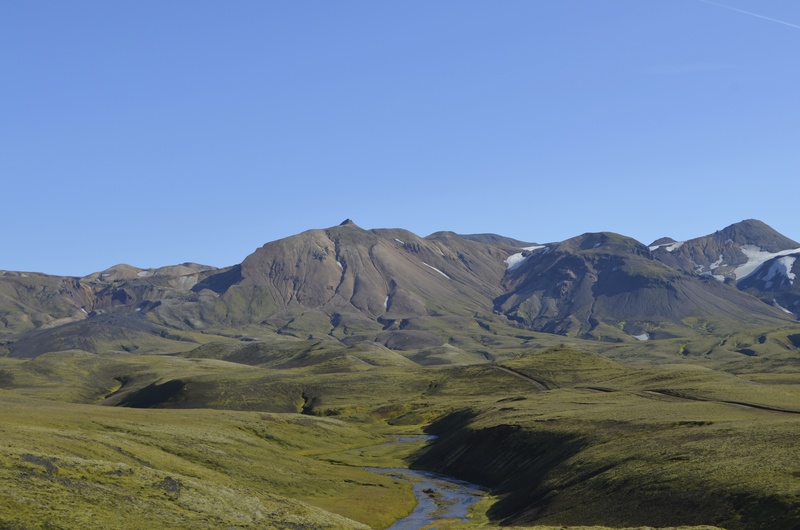 According to the Katla Geopark website, the river is 100 km long (one of the largest in the South of Iceland!) 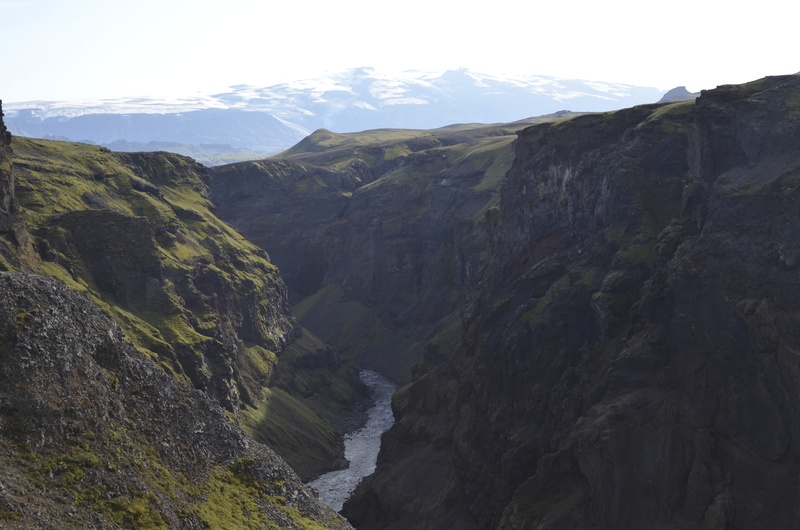 and is sourced from the two glaciers Mýrdalsjökull and Eyjafjallajökull which we would be hiking between on the fifth day. 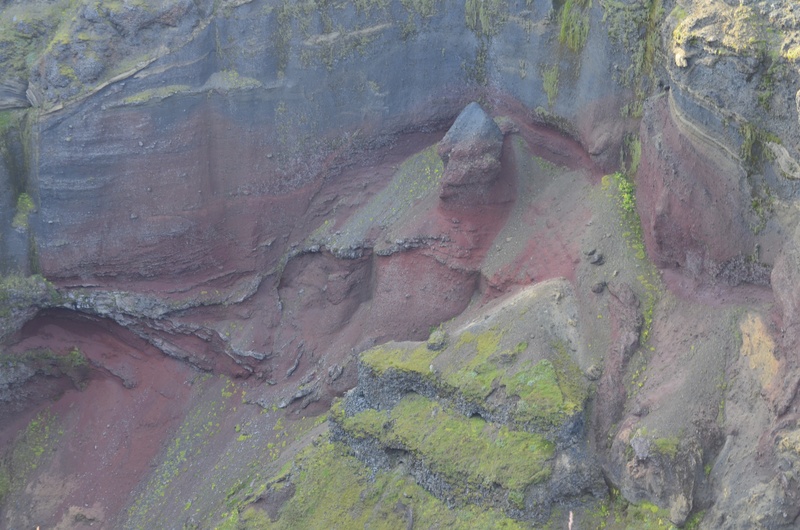 Even though it wasn’t nearly as deep as the Grand Canyon in the states, it still felt like Iceland’s Grand Canyon. My favorite part of the canyon was a lone bird gliding about against the red cliff sides. It seemed isolated, having the entire canyon to itself. Without the bird, the true immensity of the depth of the canyon couldn’t be fathomed, even while looking at it. The stark whiteness of the bird further brought out each color on the walls of the gorge, and I watched in awe as the creature glided along the eroded rock. I wanted to be this bird, I wanted to reach up close to the rock and delicately brush my hands along its sides, like a painter adding the final thin details to his work. I was vicariously living through these fragile feathers. 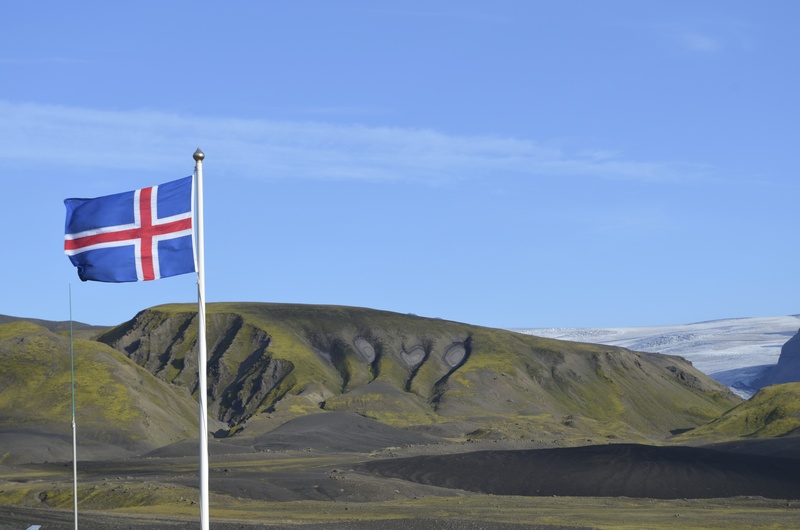 Upon treading back, a single Icelandic flag fell into view: an indication that we had made it home, albeit a temporary one. Exhausted from the sand making refuge in my shoes, I tiredly enjoyed a nice meal of Bolognese and a dessert of canned pears drizzled in chocolate syrup (much to my surprise, Svavar’s idea of dessert was actually delicious, in the strangest way). I set my sleeping bag out on a top bunk once again, feeling like I had reached a high enough summit to fall asleep on. I knew I would blissfully reach further to the sky in the morning. 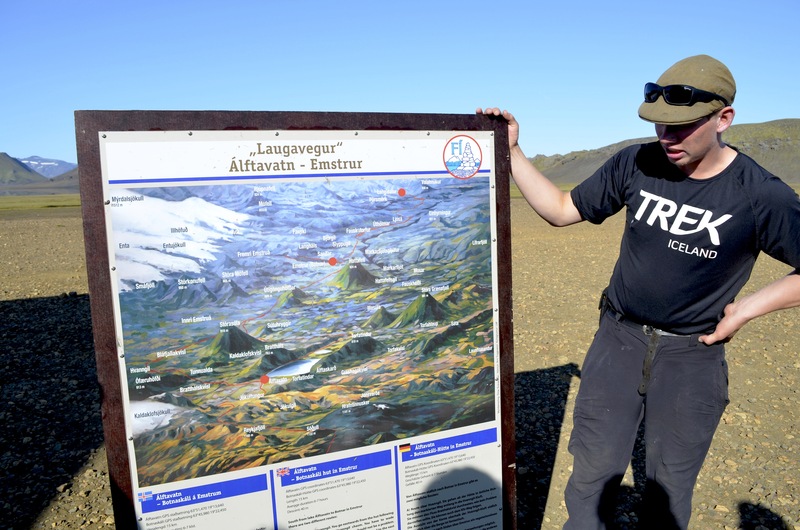 This entry was posted in Laugavegurinn Trail and tagged Emstrur, Laugavegur Trail, Markarfljótsgljúfur, mountains, Sigur Rós. Bookmark the permalink.